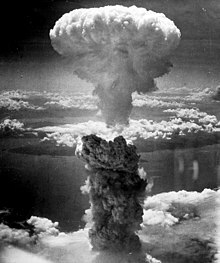 The mushroom clood o the atomic bombin o the Japanese ceety o Nagasaki on August 9, 1945 rose some 11 mi (18 km) abuin the bomb's hypocentre. A nuclear wappen is an explosive device that derives its destructive force frae nuclear reactions, aither fission (fission bomb) or a combination o fission an fusion (thermonuclear wappen). This page wis last eeditit on 27 Februar 2019, at 22:13.